Dubai is no doubt one of the most sought after tourist destinations. It caters to all the whims a tourist can have while on a vacation. Plus it suits the pocket and promises never to disappoint you. So it seems like the perfect place to go on a holiday! Whether you are still deciding if it is Dubai that you want to go to, or have booked your tickets and are packing your bags, here are a few things you should know that define Dubai. So decide whether you are up for it and pack your bags accordingly! Fasten your seat belts and gird your loins for this dare devil drive through the sand dunes across the desert. If you haven’t had your dose of adrenaline after the dune bashing, you could give sand boarding a try or just go for a camel ride if you feel like it. You could stop at various places to click pictures. Sunset photography at the desert is something every photographer would relish. After a day of excitement, you could unwind with scrumptious Arabic food and shisha while the belly dancers mesmerise you with their graceful performances around the campfire by starlight. If it interests you, get your hands or feet dyed with artistic henna designs. Recommended in the evenings, Dhow cruise is a must if you want to experience what truly defines Dubai. Spend a light evening silently gliding along the Dubai Creek in the moonlight. Witness the magnificence of Dubai from a fascinating view. You could enjoy the famed kebabs and grills with a shisha while you sing (or screech) along with the karaoke or could order some wine and get cosy and spend a romantic evening on the deck under the stars. Witness the extent of excellence the engineers have reached, with this incredible engineering feat. The man made archipelago is what Dubai advocates should be the eighth wonder of world. It is the most audacious of Dubai’s mega projects which can be seen from outer space as well. Other attractions are The World, another archipelago which depicts the map of the world and Palm Jebel Ali. A number of cruises are available which can take you on a tour through the islands. The islands themselves host a number of residential houses, hotels and restaurants. Dubai believes in out doing itself when it comes to its infrastructure and architecture. The Ibn Batuta Mall is one such example which revolutionises the entertainment and shopping experience in Dubai. The mall exhibits an exciting mix of around 275 retailers, 50 restaurants and 21 cinema screens. The main attraction of this mall though is its peerless architecture. The mall is divided into sections, where the architecture of each section is inspired by various architectural styles around the world. It has an Egypt Court, an India Court, a China Court, an Andalusia Court, a Persia Court, and a Tunisia Court. The Mall truly defines Dubai’s love for architecture and magnanimity and hence is a ‘must visit’ when you go to Dubai. This is another superlative that Dubai showcases pompously. The Dubai fountain is the world’s largest fountain. It is set on the 30 acre Burj Khalifa Lake and can shoot water jets as high as a fifty storey building, approximately 500 ft high. It has been designed by the California based WET, the creators of the Bellagio fountains in Las Vegas. The beam of light shining upward from the fountain can be seen from over 20 miles away and would be the brightest spot in the Middle East. The fountain performs daily, with performances being on songs like Sama Dubai, Baba Yetu and the top selling dance number in the Arab world- Shik Shak Shok. The Arabian music, with the graceful moves of the belly dancers is more than enough to set you in a trance. Enjoy the experience and live the moment which truly defines Dubai’s culture as you sit back and relax. The performances, along with the mouth watering Arabian cuisine and shisha ensure that you are transported into the magical land of the Arabian nights. You could probably join the dancers too if you are into belly dancing and aren’t shy about showing off your grooves! The souks in Dubai encompass a world of their own. With innumerable intervening streets it doesn’t take much to get lost in the souks. 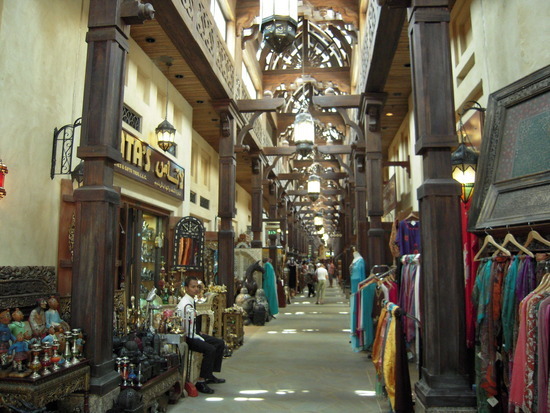 The Gold Souk and the Spice Souk are one of their kinds and add to the list of things that define Dubai. The gold souk has various shops selling malabari and elegant Jewellery, and the dazzling gold is almost blinding. The spice souk which is right next to the gold souk is rather an aromatic experience. With a little patience you can find any spice or herb grown under the sun in one of the shops here…and a lot more! For more tips on shopping in Dubai, read our blog 7 Tips for Happy Shopping in Dubai! Dubai is synonymous to its edifices. It is the abode to the tallest building, Burj Khalifa and the tallest hotel in the world, JW Marriott Marquis. So if you have a love for heights, Dubai is the place to be! Cause tall towering sky scrapers are a big part of what Dubai has to take your heart away! Though Dubai has innumerable things to flaunt, these we think are the essence of Dubai! Have anything to add? Let us know in the comments!